Our latest offering for the holidays is the Anatex Farm Life Wall by Anatex. Wall Panels are great for high traffic areas such as schools, doctors’ offices, car dealerships and all waiting rooms as there are no loose pieces to get lost and it keeps everything nice and tidy. But also, no matter where you put an Anatex toy, kids are automatically gravitated to it (parents too!). And at the same time, children learn. 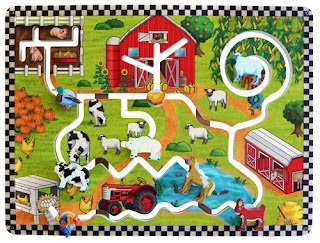 With the Anatex Farm Life Wall Panel children are endlessly entertained as they move the farm animals to travel around the beautiful farm. The farm landscape includes, grazing animals, tractor, rows of corn, pumpkin patch, haystack and greenery. While guiding the farm animals along the paths, children’s eye-hand coordination, visual tracking, and sensorimotor skills are challenged. For further info, simply click on the picture.